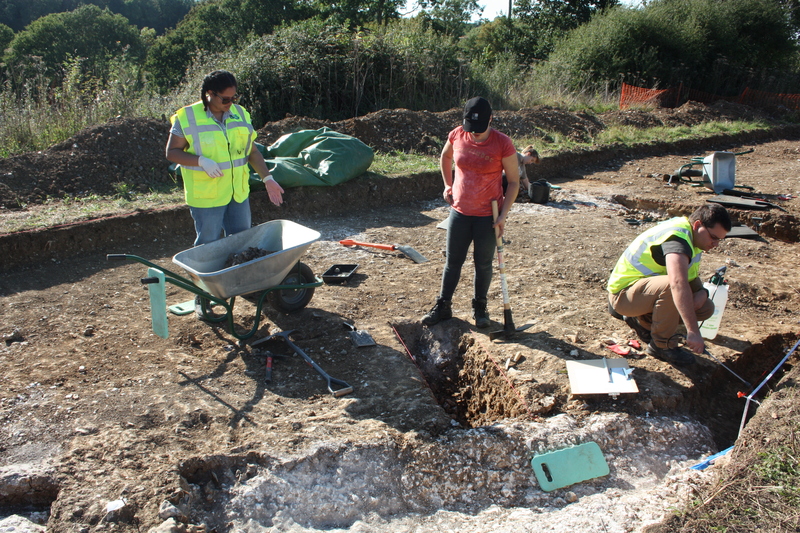 Last month, Classical and Archaeological Studies students attended an excavation run by Kent Archaeological Society (KAS) at Lees Court Estate near Faversham. KAS decided to undertake the project after not one, but five Bronze Age hoards were found in the area. The discovery of these hoards had come as a surprise, as it had long been assumed that there had never been much activity in the area prior to modern times, but, as these finds and the subsequent work undertaken by KAS and Kent students has shown, this area was host to considerable prehistoric activity. KAS first conducted an excavation in the area last year, when they uncovered a large ring-ditch that encircled a causewayed enclosure. It was found to contain prehistoric pottery, as well as worked-flint that had been used as tools, which dated to the mid-Neolithic period (c.3300 – 2900 BC). Following a geophysical survey of the surrounding area (essentially an x-ray of the ground), KAS returned to the site and uncovered a large area that produced evidence of a small settlement close to the enclosure. 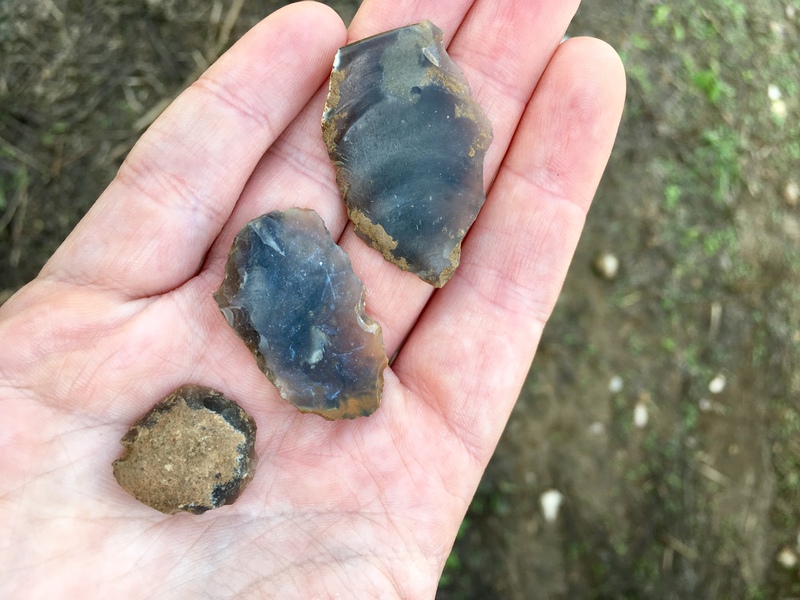 This came in the form of post-holes indicating where buildings once stood, pits, indications of burning, a large amount of pottery, and more worked-flint. To the south of the main KAS excavation were the ground slopes down into a valley. The geophysical survey detected another, smaller ring ditch, which the Kent students were tasked with uncovering. 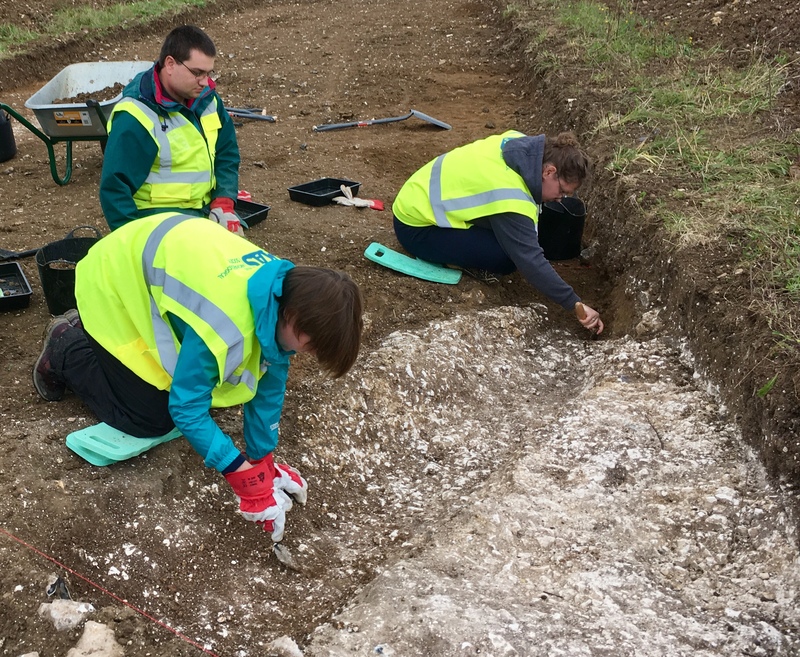 After a digger was brought in to remove the upper layers of top-soil, the students began to clean down in search of the ring ditch, although millennia of hill-wash that had been deposited over the natural chalk surface made understanding the stratigraphy difficult. Initially, we discovered a shallow linear ditch, which cut across the trench in a straight-line running north to south and had been dug into the natural chalk. This feature did produce a small bit of prehistoric pottery, but the jury remains out on whether the ditch is prehistoric in date – in any case, this certainly wasn’t the ring-ditch, as it was too shallow and clearly not ring-shaped. 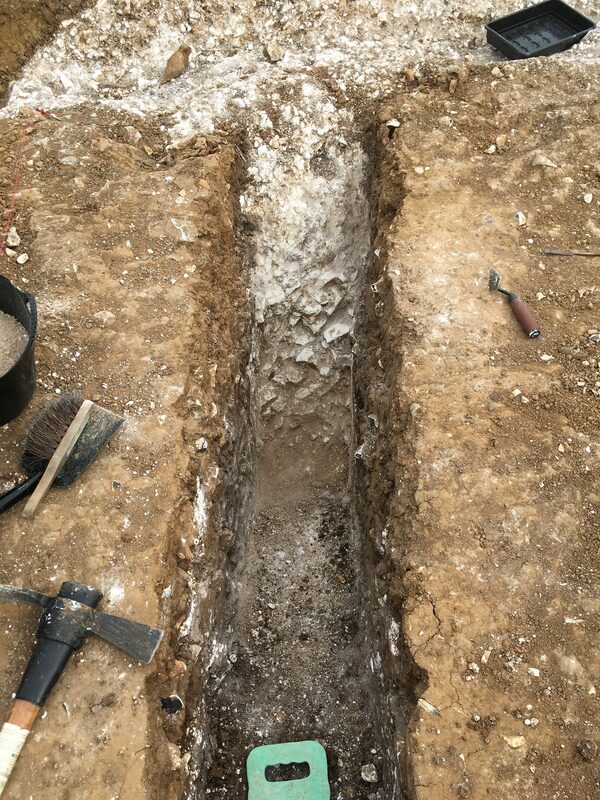 However, further excavation indicated that alongside this ditch the chalk suddenly dropped off abruptly. So abruptly, in fact, that it could not have occurred naturally – bingo, the ring-ditch! From the students’ excavations and the geophysical survey, the ditch looks to be c.15-20m in diameter, c.1-1.5m wide, and c.1.0m in depth. Further small bits of pottery were also found within it, although much of the ditch is yet to be uncovered, so who knows what else is to be found at the bottom of it. When the students cleaned back around the southern side of the ditch, they discovered that it encircles a deposit of silty-chalk, perhaps dug out of the surrounding ditch and heaped into the middle to provide a foundation for a barrow. Barrows were burial monuments common in prehistoric Britain and Europe, which involved the dead being buried, a ditch dug around the grave, and the soil removed from the ditch piled onto to the grave to make a mound. These burials would often be located at elevated spots, and sometimes lined with chalk, so that they could be seen from great distances. Strangely, on the inside of the ditch, close to the edge, was what appeared to be a post-hole, perhaps indicating some form of structure was erected on top of the barrow. However, with just the one post-hole we cannot be sure. 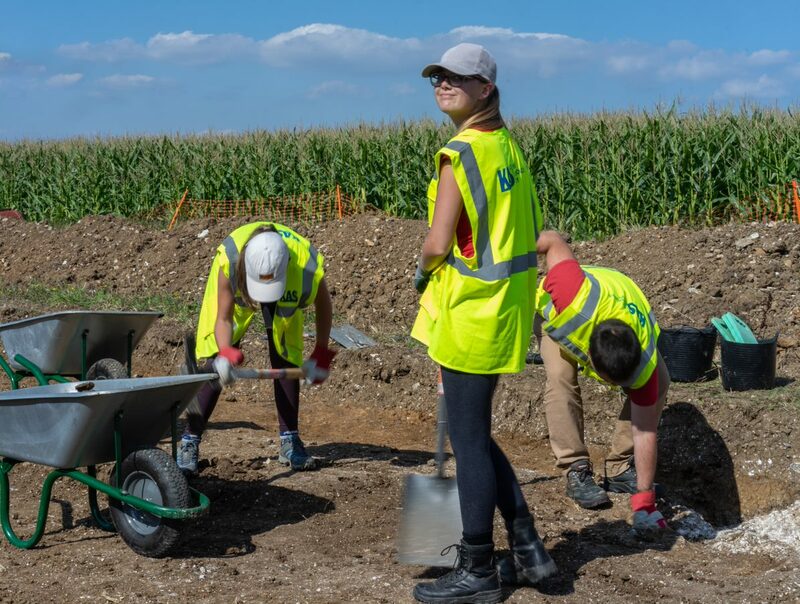 Across the coming autumn term, Steve Willis will be returning to the site with Kent students undertaking the ‘Professional Archaeology: Techniques and Methods‘ module, and hopefully, they will be able to add more information to our understanding of the monument. In engaging with the dig, our students were able to learn the fundamentals of not only physically excavating archaeological features, but also how one goes about recording these, including how to draw plans and sections, photograph them, and filling out context sheets that can be put into a database. They were also given a chance to undertake surveying alongside one of Kent’s own success stories, Fred Birkbeck. Fred finished his undergraduate at Kent last year in Classical and Archaeological Studies, during which he had learnt how to use the surveying equipment in the department, which had allowed him to conduct his own survey for his dissertation. Fred has now been employed by KAS to conduct a survey of the whole area, putting his newfound expertise into practice. Overall, the project has begun to fill in a large gap in the history of Kent. It also demonstrates that where we might believe there is nothing of interest, we can be proven wrong. What was thought to be an empty landscape was in fact populated by Bronze Age people going about their lives in view of their ancestors buried in large mounds nearby. This project clearly highlights how you never know the full story of a place until you dig! Many thanks go to KAS for providing this opportunity for the students and funding transport, as well as to Paul Dyer for financing the project. We are also very grateful to Countess Sondes, the owner of the Lees Court Estate, for her support and allowing this excavation to be conducted on her land.